Waldo Williams was baptised and accepted as a member of Blaenconin Baptist Chapel, Llandysilio, by total immersion, as was the custom, by his minister, the Rev D. J. Michael, when he was 16 years old, in April 1921. The family were already members and although Waldo’s father, John Edwal, preferred to be inconspicuous in the back pew, his uncle, Gwilamus, was a deacon and also fulfilled the duties of the secretary. Both contributed regularly to a short-lived Baptist publication circulating in the Taf and Cleddau Valleys, Y Piwritan Newydd (The New Puritan). Waldo’s cousin, Gwladys Llewelyn, assisted with the Band of Hope and for many years she distributed one of the periodicals, Seren Gomer among the members. Waldo was a faithful and industrious chapel member in his youth. When he returned to the area following his college days he would often address the Young People’s Guild on a variety of literary topics. It was at Blaenconin that he married Linda Llewelyn in April 1941. But on moving to the Lleyn Peninsula and then to England, Waldo seemed to distance himself from Blaenconin as he did not always contribute financially to sustain the chapel and the ministry as was expected of all members. Even so he did not join another chapel although he would often attend other chapels wherever he found himself on a Sunday. 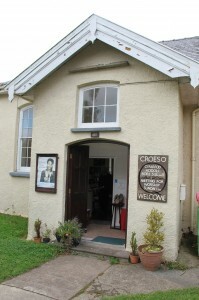 Then, when he returned from England and decided not to pay his income tax, he received an invitation from Steffan Griffith to attend the Friends Meeting House in Milford Haven. Their style of worship in silence without a pulpit or deacons pew appealed to him over and above the half hour sermon or longer that was judged, more often than not, on its eloquence and entertainment value. The often-asked question ‘how did you enjoy the sermon?’ was not a pertinent question in Waldo’s view. Waldo would soon be cycling and travelling by train every Sunday to join the Quakers at Milford Haven where he sought strength and inner peace. Even so he did not break all ties with Blaenconin despite terminating his membership there. He was invited to salute the minister on behalf of the children who had moved away on the occasion of D. J. Michael’s retirement in 1962. And, of course, Waldo was buried in an unpretentious grave, as is the Quaker practice, at Blaenconin cemetery close to his wife, Linda, and where other members of the family already lay. Well, the Quakers’ way of worship makes it easier for man to look at God in unison with his own feelings regarding such a matter, and at the same time feel at one with his community – because of the immense solitude and the joint ministry, and the prompting upon us to keep an open mind towards the Light. To be honest, I believe it is this matter, the belief inherent in me since I was a young man that strove me on the path towards the Quakers, although it is not characteristic of them. I had nothing from them, either, but an emphasis and development on matters I had come to recognize primarily amongst the Baptists . . . despite the fact there are so few of us, we believe the similarities between men are more than their differences, we are able to receive the Inner Light. That is the foundation of the pacifism that is so strong amongst us, and in our social work.